We’re on a bit of a smoothie kick over here and so I wanted to share one of the kids’ favorite recipes with you. Smoothies are such a fantastic ways to get your little ones the vitamins and nutrients they need to help their tiny bodies grow big and strong. I love them because they are so easy to prepare and the clean up is simply washing out your blender and sitting it on the counter to dry. That kind of cooking is essential when chasing bubs around the house all day long, so we make them daily. My rule of thumb when making smoothies is to combine a fruits & greens or veggies while staying clear of ingredients with a high sugar content, like processed foods and ones that contain artificial sweeteners. One healthy green we’ve been buying in bulk at the market and putting in just about everything lately is Tuscan kale. Our kids happen to like kale (I know, right?) but if need be, I can be pretty sneaky when it comes to hiding it into just about anything, whether I’m making supper or a savory breakfast. But truth be told, you can’t really disguise this gorgeous and green when blending it into a drink. 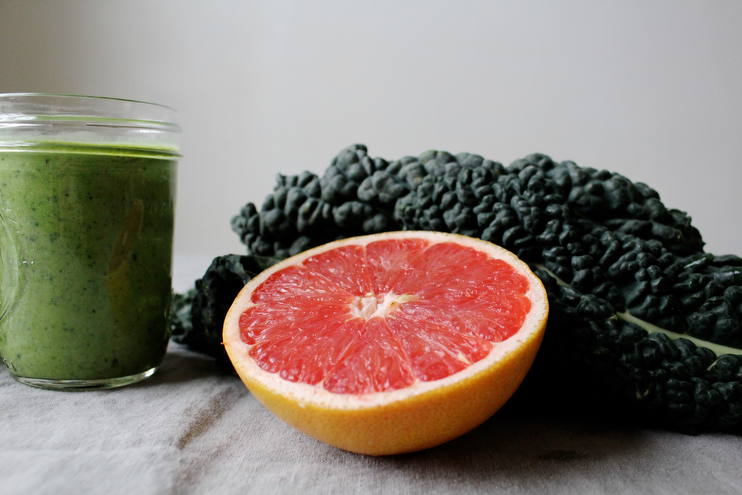 If you’re going to add kale, know your smoothie will be green, there’s no way around that! To make up for the sometimes bitter flavor, I like combining it with tart grapefruit essential oil to balance it out. It freshens this drink right up and is one I find myself making over and over for Stella and Theo when they are wanting a healthy snack. 2-3 large stalks of raw Tuscan kale – Well, it’s kale so there’s that. This superfood is full of everything and anything you could ask for in the wellness department. 1 cup Ella’s Kitchen Coconut Water with Electrolytes – Contains rehydrating and replenishes nutrients and is a good substitute for water if the kids are needing an extra boost. 1 cup raspberry Siggi’s yogurt – This tart Icelandic style yogurt is chalk full of probiotics, has no artificial preservatives or sweeteners and is really high in protein. It is thinner than the traditional yogurt you may be used to, so it works really well in smoothies. My little ones don’t care for this by itself, but in smoothies they’ll drink it right up. 1 ripe banana – Adds a creamy base, natural sweetness and potassium. 2-3 drops Grapefruit Essential Oil – Adds a bright flavor while supporting wellness in a variety of ways. Since essential oils never expire, they are absolutely wonderful additions to healthy snacks like this because they add flavor and heath promoting benefits without having to run to the store. 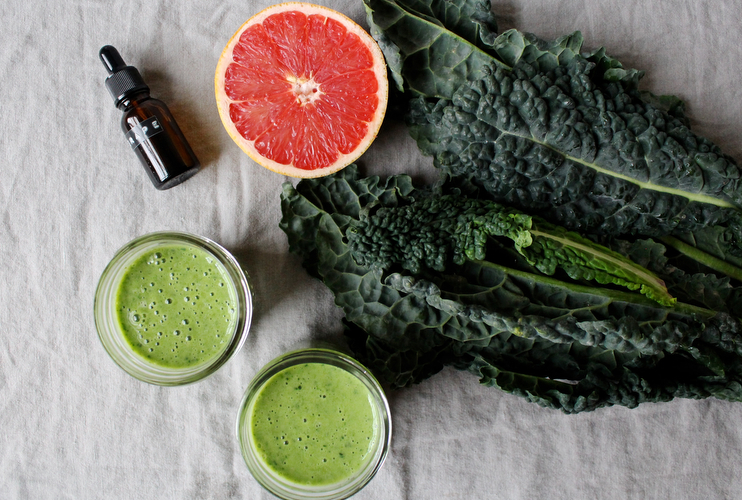 Other citrus oils such as lime, lemon and tangerine are other favorites of ours to add to smoothies. Keep in mind, oils are very concentrated and you’ll only need one drop or two when using in recipe. Moreover, we use only pure therapeutic-grade oils by Young Living that are safe to ingest. Not all oils are created equal. You can read more about this under Homesong Essential Wellness. 1 tablespoon of local honey – Adds natural sweetness while helping with allergies. Thanks, Tiff and Dan for hooking my honey loving family up! 2 ice cubes – Chills it down. To prepare, add all above ingredients to your blender or vitamix and blend away until all ingredients are well incorporated. 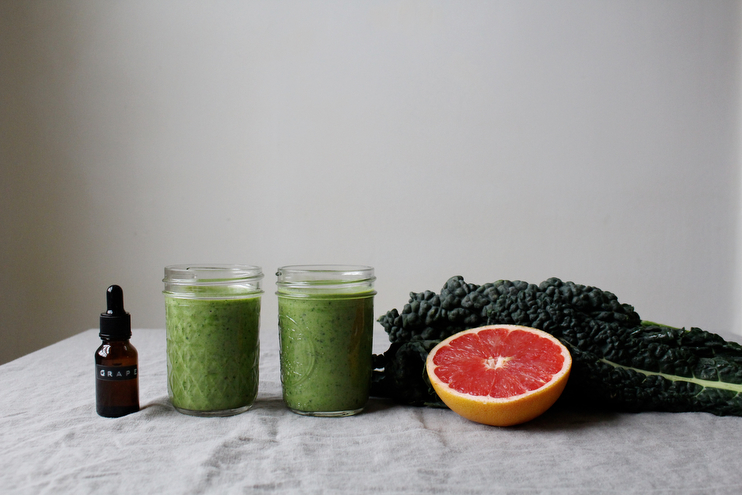 This recipe makes two smoothies like you see above, so just double this recipe if wanting more. What smoothie recipes do you find yourself making over and over for you little ones? I’d love to hear winning combos and other healthy ingredients you enjoy. Hey Amanda! This summer, I discovered the wonder of adding fresh mint leaves to just about any smoothie we made. It freshens it up and is really amazing! I’ll have to try that recipe! Thanks for sharing. Mint Chocolate “Milkshake” – it’s green!